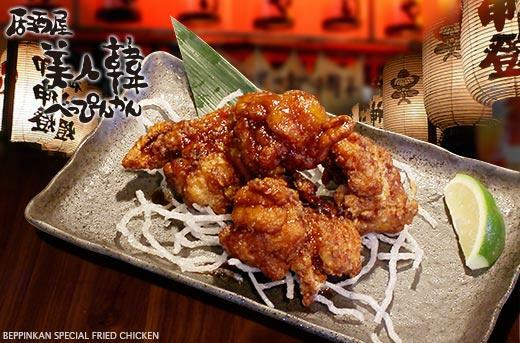 interesting offer at Metrodeal for a Special Fried Chicken at Izakaya Beppin Kan at 50% off. Regular price is at PhP245 and you only pay PhP122. Good enough for me to go on a foodie adventure. I've seen the place before but haven't really tried it. For some reason, I just hadn't thought of sampling their Japanese-Korean cusinie before even if it's not that far from my place. Of course, I checked for Metrodeal reviews of the place before really embarking on the culinary journey. I wouldn't want to waste my money on anything I might regret later just because I got swayed by some pictures online. I've tried buying from Metrodeal before and the experiences had been pretty good since I love the big discounts I got from salon services and restaurants but most of those I bought before are from known establishments so I didn't have much to worry. For Izakaya Beppin Kan in BF Homes, however, I'm not too familiar yet so I had to thread carefully. I bought 2 vouchers for my hubby and I and we decided to try it last night for dinner. I was pleasantly surprised that the fried chicken was as good as described! I love the texture and flavor that bursts in my mouth with each bite I took. The skin was crisp but the meat was tender to chew on. Even the crispy rice noodles had been fun to much on.